I have reviewed your online store and have not located this particular part, maybe I'm just overlooking it but I need your help Identifying it and/or your listing for it,please. from LG50pc3d-ud plasma,, ysus board 6871qyh039b,, ipm 201 #yppd-jo16e-c and ipm 202, yppd-j015e-c.
please send listing or correct replacement part number and pricing info. P.S. I want to say thanks for the help I have gotten via your blogs! great job! Our store is definitely a work in progress as of November 2012. A year ago I posted an article about replacing the original inverter in Insignia NS-LCD37 LCD TV with 4H.V1448.481 since it was more available and cheaper. Well since then the newly installed inverter has also failed - in fact twice - and the second time I opted to repair it as opposed to replace it since I already had a dud handy. The same backlight inverter 4H.V1448.481 is used in a good number of other LCD TVs such as Philips 32PFL5322D/37, PROSCAN 37LB30QD, Sanyo DP37647 and in fact many more, so hopefully this will help others in same boat. Failure symptoms were the same both times - display will lit up for a split second and will then turn black, the TV otherwise still operating properly. Inspecting the inverter I found a blown SMD fuse - one of several along the length of the board - and that told me in which section the problem will be. As can be sen from the picture the fuse is 3A/32V and is driving two power transistors, each of which in turn drives a transformer on the board (well the last can not be actually seen on this picture; just take my word for it, ok?). So there is one such fuse for every two power transistors / transformers and you will be looking for a fuse that is blown and does not have continuity. Once I got the group, I first ruled out the power transistors by comparing them and finding out that they have the same resistance as all others. The culprit turned out to be - not surprisingly actually - one of the two transformers although I could not figure which one until I put a more powerful fuse (5A as opposed to 3A) and tried to see what happens. But I do not recommend you do that. As it turned out, the bad transformer could very easily be distinguished once pulled out of its place and inspected on the back. Clearly it was the primary winding that has burned and because it has low resistance I could not find the difference with a meter. Replacing the transformer with a pull-out from the first defective board restored full functionality....for now. Just a week ago I posted an article about a SCK206 question and by pure chance today we had a power board DYP-50W2 from Samsung HPT5054 brought in for repair. It had a visibly cracked component KL15L 5R1 which we tracked down and found a substitute for, then since customer was willing to pay extra for an express service we decided to take out a component from a working board and replace it in the customer's board, then wait and restore the substitute in our own good board...which we sometimes do if you're willing to pay for breaking a good working unit to get yours back faster. Anyway, we found that our own board had the same SCK206 in place of KL15L5R1. By the time we realized it the old thermistor was already out of the board so I could only put it next to the one that was originally placed on our own board. In all fairness I didn't even look to track down SCK206 details and compare them. If Samsung has decided it will do - and this was an original component there - then it will definitely do the job. And if you are looking for KL15L5R1 then chances are SCK206 will do for you too. 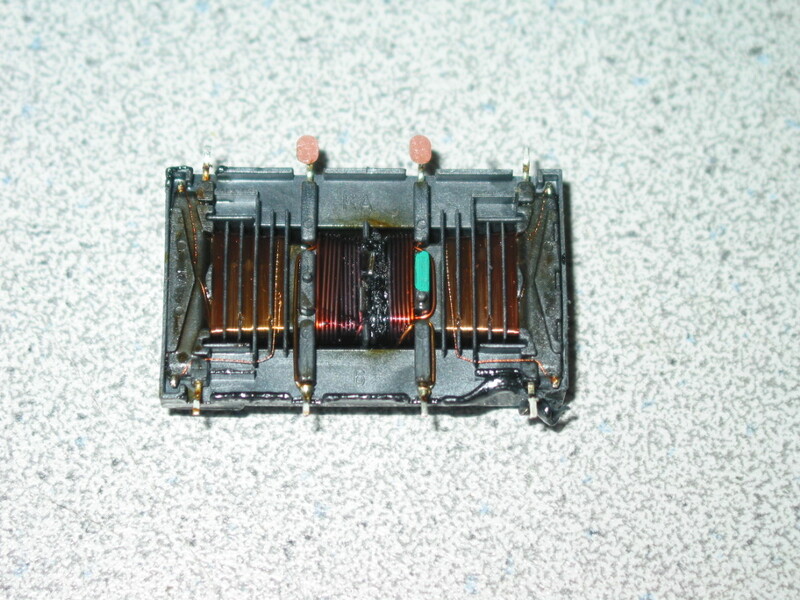 BTW, as noted in the previous article the problem was not in the thermistor alone. 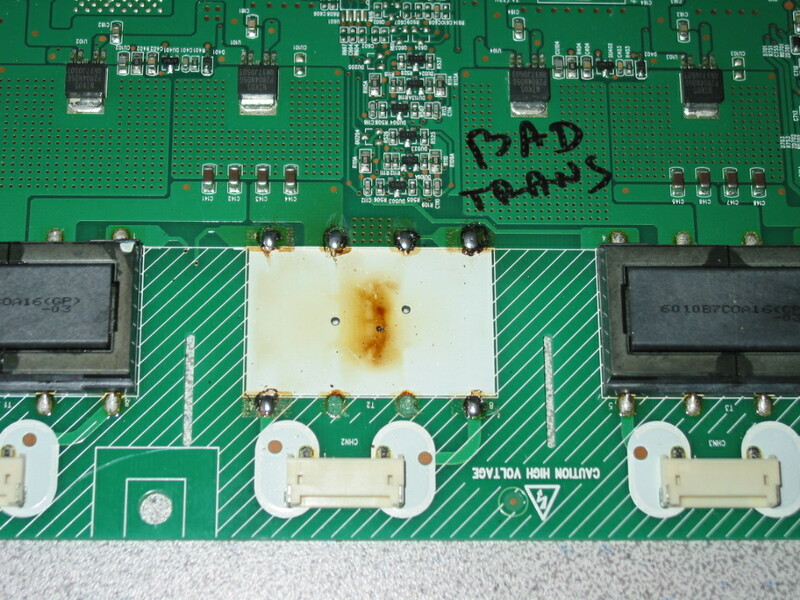 Some power FETs were also blown and some of the driving logic around them too, although. My recommendation is that unless you are a service tech well aware of the risk they're taking with a DIY project you better get a repair service or replacement board. 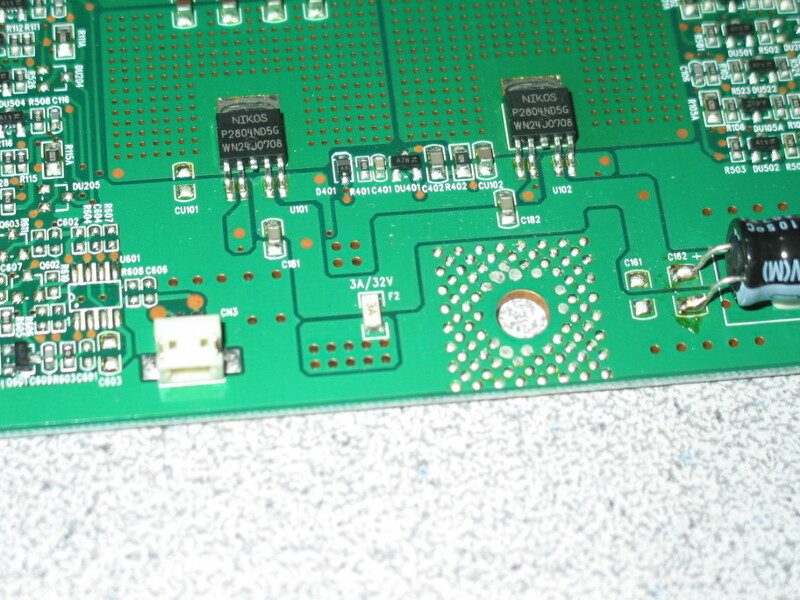 4 February 2014 update: We just posted an article on testing BN44-00160A DYP-50W2 and a bunch of other boards. 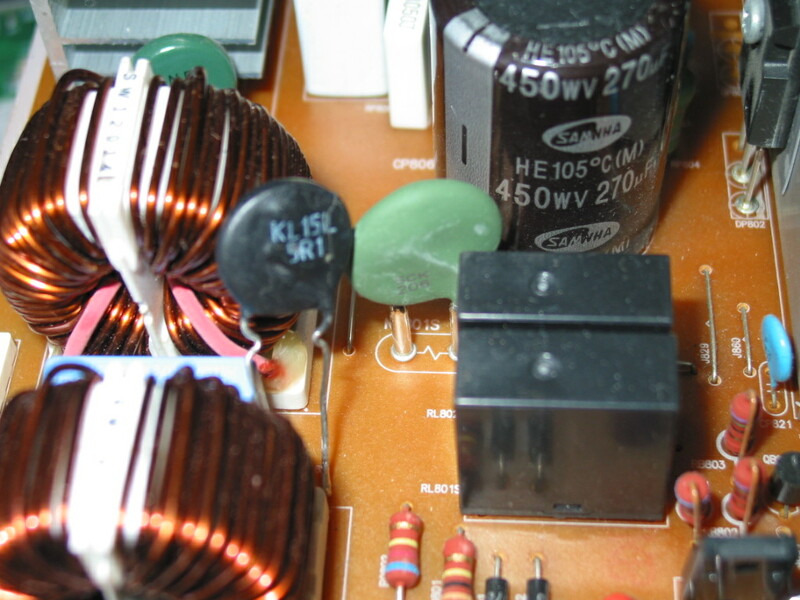 You do not need that posting if you already know you have a blown thermistor, but the article may still be of help to others.